Therefore, just as sin entered the world through one man, and death through sin, in this way death spread to all men, because all sinned. Just as sin entered the world through one man, and death resulted from sin, therefore everyone dies, because everyone has sinned. Because of this, just as through one man sin entered into the world, and death through sin, so also death passed to all men, in that all sinned. Therefore, as sin came into the world through one man, and death as the result of sin, so death spread to all men, [ no one being able to stop it or to escape its power] because all men sinned. Therefore, just as sin came into the world through [the action of] one man [i.e., Adam] and [physical] death through that sin, so [physical] death has spread to all people, because all people have sinned. [Note: This difficult passage (verses 12-21) seems to be saying that the entire human race must experience physical death because of Adam's sin (I Cor. 5:22), which is somehow considered to be everyone's sin. See Murray, pp. 180-187, for a thorough discussion]. Therefore, just as sin entered the world through one man, and death through sin, so death spread to all men, because all men sinned. Wherefore, as by one man sin entered into the world, so death by this sin; and thereby death passed upon all men, who all by his means became mortal. It is just like the way in which through one man sin came into the world, and death followed sin, and so death spread to all men, because all men sinned. 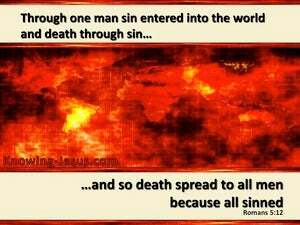 Therefore as by one man sin entered into the world and death by sin, even so death passed upon all men, in that all had sinned. Therefore, in the manner which sin entered into the world by one man, and because of sin, death; and so death passed upon all men in the one in whom all sinned. Because of this, just as sin entered into the world through one man, and death through sin, so also death spread to all people because all sinned. Wherefore, as by one man sin entered into the world, and death by the means of sin; And so death went over all men, insomuch that all men sinned. Thus, then, sin came into the world by one man, and death came in by sin; and so death spread to all men, inasmuch as all men sinned. Thus, then, sin came into the world through one man, and through sin came death and so death spread to all men, because all had sinned. Therefore, as sin entered into the world through one man, and death through sin; and so death passed to all men, because all sinned. Therefore, as by one man sin entered into the world, and by sin death; even so death passed into all men through him, in whom all have sinned. 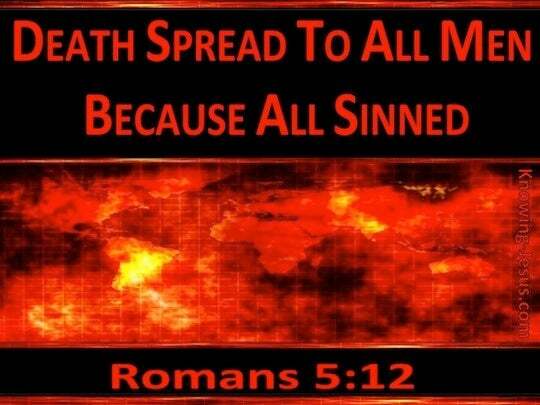 Therefore, just as sin came into the world through one man, and through sin came death; so, also, death spread to all mankind, because all men had sinned. Wherefore as by one man sin entered into the world, and death by sin; and so death passed upon all men, for that all have sinned. What follows? This comparison. Through one man sin entered into the world, and through sin death, and so death passed to all mankind in turn, in that all sinned. So here is the comparison: As through one man sin came into the world, and death as the consequence of sin, and death spread to all men; because all men sinned. 11 And not only this, but we also exult in God through our Lord Jesus Christ, through whom we have now received the reconciliation. 12 Therefore, just as through one man sin entered into the world, and death through sin, and so death spread to all men, because all sinned-- 13 for until the Law sin was in the world, but sin is not imputed when there is no law. "Behold, all souls are Mine; the soul of the father as well as the soul of the son is Mine The soul who sins will die.